If I had to eat one type of food for the rest of my life it would be Mexican, hands down. I love the bold flavors, textures, and that you can basically turn the same 5(6,7,8) ingredients into countless different meals. Taco Bell really has this concept down. I don’t think they’ve had to change their ingredient lists, like, ever. Well, except for that one time that they decided to sell Frito Burriots. That was weird. 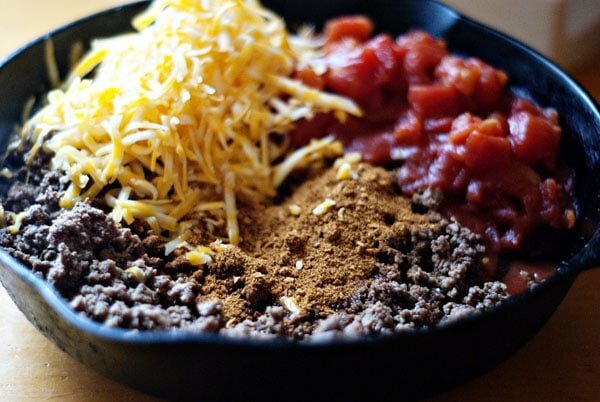 This taco casserole is proof that you can create a completely different eating experience with the same basic ingredients just by by switching up the cooking style. 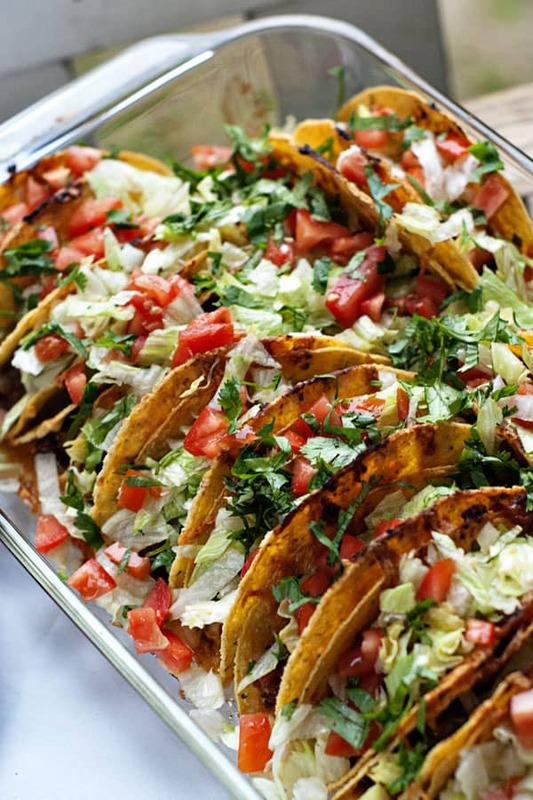 In this case we’re stuffing the taco shells and baking them all together in one pan. You’re not going to end up with a completely crunchy taco that you’re able to eat one-handed while driving to work (remember $0.29 Tuesdays? Those were the days!). 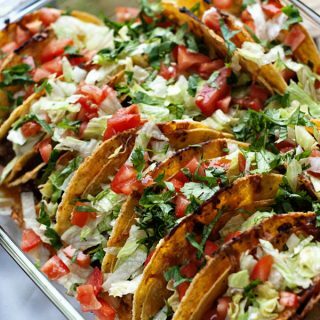 But you ARE going to end up with a plate full of Mexican goodness that is half crispy, half saucy, and flavorful all-around. 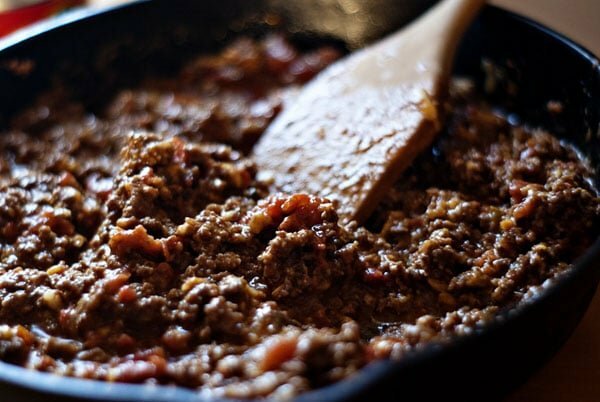 Start by browning a pound of ground beef or turkey. Add in some cheese, canned diced tomatoes, taco seasoning, and salsa verde. If you want a little info on what kind of salsa verde to use read this post because not all are created equal. Meaning, that some are burn-your-face-off hot! Stand 12-15 shells up in a 9×13″ casserole dish. If they aren’t all standing up straight they will be easier to move around once they are filled and have some weight to them. I might try the shells with the flat bottoms next time and see it that makes things a bit easier. Top with some glorious cheesey cheese. And bake for about 15-20 minutes or until the cheese it melted and the meat is hot. 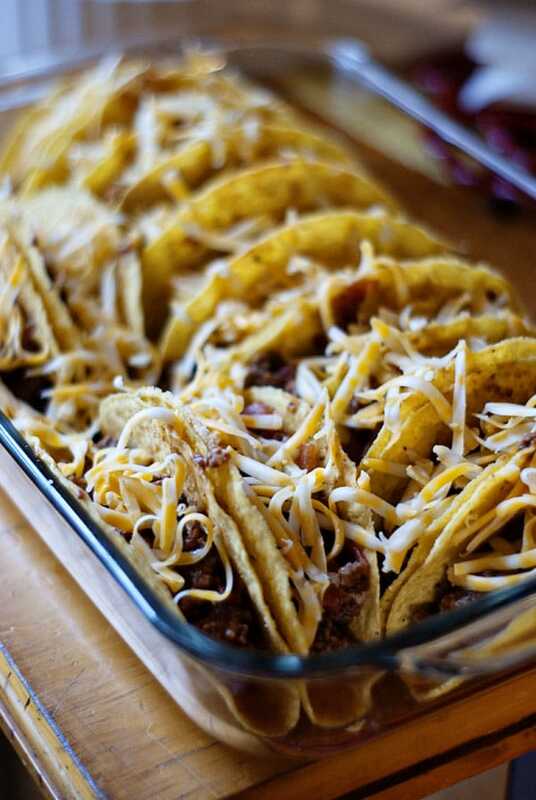 Remove from the oven and top with all of your favorite taco fixin’s. I like to top the whole thing with shredded lettuce, tomato, and cilantro and then serve with sour cream, guacamole, and a squeeze of lime juice. Stir tomatoes, seasoning, ½ C cheese, and salsa into meat. 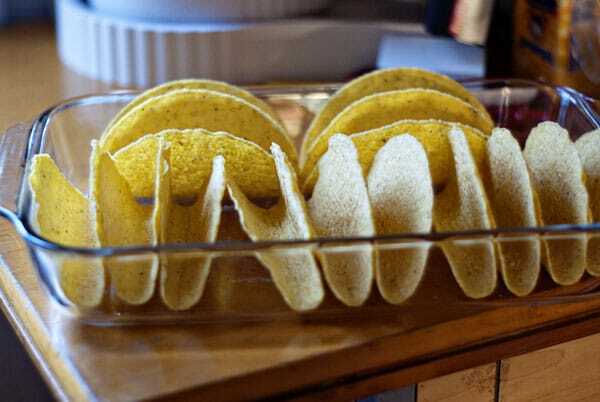 Sprinkle remaining ½ C of cheese over the tops of the filled tacos and bake for 15-20 minutes. Cheese will be melted and the meat hot. SO EASY TO MAKE AND VERY TAST1 IT IS SO GOOOOO1. These were really good! I had All the ingredients for tacos and remembered this from Pinterest. Such a nice change from boring tacos! My husband loves black beans so I added them to the shells first. Might try shredded chicken/Monterey Jack next time!! Making this tonight. DELISH!!! I have made several times before. 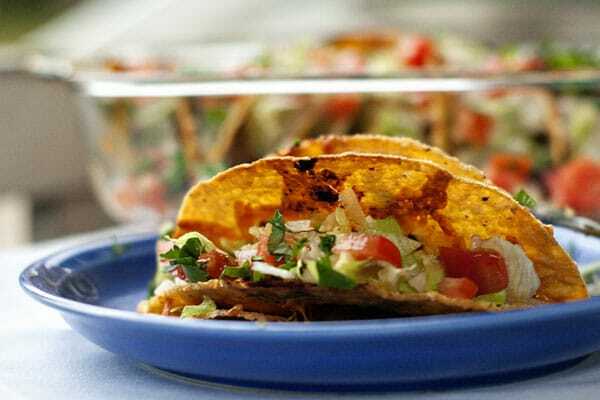 Made this for dinner tonight, made one change my husband likes to have refried beans at the bottom of taco shells and used the Stand and Stuff Taco Shells. One other note; Salsa Verde if you can get it where you live Herdez is good, not hot. I agree, the stand and stuff shells work great! Thanks for the substitution list, Michael! I made as directed. I did use the flat bottomed shells. They’re at bit thicker than standard shells. This made them slightly softened but not at all soggy. We ate them with our hands without them falling apart. I love it! I recommend using the flat bottomed shells.